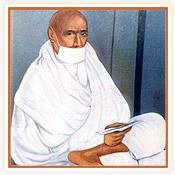 Sri Dalchandji was seventh Acharya of Terapanth. He lost his father at very young age and his mother accepted sainthood when Sri Dalchandji was just 11 years old. He had developed much matured personality at such young age. After three years he also took sainthood under Munishri Hiralalji at Indore, MP, India. He has developed well rounded personality and became very effective speaker of his time. Due to his exceptional qualities, fourth Acharya Sri Jeetmalji appointed him as team leader (Aggrani) within seven years of his sainthood, at the age of just twenty one years. His well rounded personality, logical, straight thinking has made a place for himself in the Sangh. He fearless attitude helped to solve many challenging situation confronted Sangh. As a team leader, under Acharya’s guidance, he undertook padyatras in many areas like Bela, Kutch etc. In Terapanth, Acharya is appointed by previous Acahrya only. But for the first time in the history of Terapanth, sixth Acharya achieved Nirvana at Sujangarh without appointing his successor. Also, at that point of time there was no process to deal with such situation. Whole Terapanth Samaj was challenged by such unexpected development. Leading Saints at Sujangarh got together and decided to call all Saints at Ladnun after Chaturmas to decide on next Acharya and made plans to manage the Sangh effectively till then. Seniormost saint Kaluji after completing wider consultation and assessing various situations announced the name of Dalchandji as seventh Acharya of Terapanth at Ladnun, Rajasthan, India. He steered Terapanth Samaj as Acharya for approximately twelve years very effectively and took it o new heights. He had to face many challenges during his leadership. His health deteriorated rapidly at Bidasar. He appointed Saint Kalugani as his successor. He achieved Nirvana at very young age of 59 years at Bidasar.